This is paper outlines some of the potential advantages of multiuser OFDM. An overview of several new techniques that improve system reliability and spectral efficiency are presented. These include adaptive modulation, adaptive frequency hopping, and multiple transmitter cells. A low bandwidth hardware implementation is also presented. OFDM has been widely used in broadcast systems. It is being used for Digital Audio Broadcasting (DAB)  and for Digital Video Broadcasting (DVB) in Europe and Australia. It was selected for these systems primarily because of its high spectral efficiency and multipath tolerance. OFDM transmits data as a set of parallel low bandwidth (100 Hz - 50 kHz) carriers. The frequency spacing between the carriers is made to be the reciprocal of the useful symbol period. The resulting carriers are orthogonal to each other provided correct time windowing at the receiver is used. The carriers are independent of each other even though their spectra overlap. OFDM can be easily generated using an Inverse Fast Fourier Transform (IFFT) and received using a Fast Fourier Transform (FFT). High data rate systems are achieved by using a large number of carriers (i.e. 2000-8000 as used in DVB). OFDM allows for a high spectral efficiency as the carrier power, and modulation scheme can be individually controlled for each carrier. However in broadcast systems these are fixed due to the one way communication. In most communication systems two-way communications is required and multiple users must be supported. OFDM can be applied in a multiuser application producing a highly flexible, efficient communications system. Little work has been previously done on multiuser OFDM. It was first presented by Wahlqvist  who suggested one possible implementation. The system design of a multiuser OFDM system is dependent on the intended application and hardware complexity. This paper presents multiuser OFDM in a more general form and outlines some of the potential techniques that could be used to make it a highly efficient and reliable communication system. Additionally a test hardware solution is presented using SHARC® Digital Signal Processors (DSP) demonstrating the feasibility of a simple multiuser OFDM system. Most OFDM systems use a fixed modulation scheme over all carriers for simplicity. However each carrier in a multiuser OFDM system can potentially have a different modulation scheme depending on the channel conditions. Any coherent or differential, phase or amplitude modulation scheme can be used including BPSK, QPSK, 8PSK, 16QAM, 64QAM, etc. Each modulation scheme provides a trade off between spectral efficiency and the bit error rate. The spectral efficiency can be maximised by choosing the highest modulation scheme that will give an acceptable Bit Error Rate (BER). In a multipath radio channel, frequency selective fading can result in large variation in the received power of each carrier. For a channel with no direct signal path this variation can be as much as 30 dB in the received power resulting in a similar variation in the SNR. Using adaptive modulation the carrier modulation is matched to the SNR, maximising the overall spectral efficiency. In systems that use a fixed modulation scheme the carrier modulation must be designed to provide an acceptable BER under the worst channel conditions. This results in most systems using BPSK or QPSK. These give a poor spectral efficiency (1-2 bits/s/Hz) and provide an excess link margin most of the time. Using adaptive modulation, the remote stations can use a much higher modulation scheme when the radio channel is good. Thus as a remote station approaches the base station the modulation can be increased from 1 bits/s/Hz (BPSK) up to 4-6 bits/s/Hz (16QAM - 64QAM), significantly increasing the spectral efficiency of the overall system. Preliminary results show that for a cellular network the system capacity can potentially be doubled using adaptive modulation. There are several limitations with adaptive modulation. Overhead information needs to be transferred, as both the transmitter and receiver must know what modulation is currently being used. Also as the mobility of the remote station is increased, the adaptive modulation process requires regular updates, further increasing the overhead. There is a trade off between power control and adaptive modulation. If a remote station has a good channel path the transmitted power can be maintained and a high modulation scheme used (i.e. 64 QAM), or the power can be reduced and the modulation scheme reduced accordingly (i.e. QPSK). Distortion, frequency error and the maximum allowable power variation between users limit the maximum modulation scheme that can be used. The received power for neighbouring carriers must have no more than 15-30 dB variation at the base station, as large variations can result in strong signals swamping weaker carriers. Intermodulation distortion (IMD) results from any non linearites in the transmission. This IMD causes a higher noise floor in the transmission band, limiting the maximum SNR to typically 30-60 dB. Frequency errors in the transmission due to synchronisation errors and Doppler shift result in a loss of orthogonality between the carriers. A frequency offset of only 1% of the carrier spacing results in the effective SNR being limited to 30 dB . The limited SNR restricts the maximum spectral efficiency to approximately 5-7 bits/s/Hz. There are several methods for allocating carriers to users. The main three groups are grouped carriers, spread out carriers and adaptive carrier allocation. The simplest scheme is to group the carriers allocated to each user. Grouping carriers minimises inter-user interference due to distortion, power level variation and frequency errors. However, grouping the carrier makes the transmission susceptible to fading, as the whole group of carriers can be lost in a null in the spectrum. This problem can be partly overcome by frequency hopping the carriers. In user allocation scheme described by , groups of carriers are transmitted in short time blocks. These blocks were randomly frequency hopped to ensure that the time period spent in a null would is relatively short, approximately 11 symbols. To recover data lost during a null, time interleaving and forward error correction was used. These come at the cost of reduced capacity and an increased delay. A new adaptive hopping technique is proposed such that carrier block hopping is based on the channel conditions. After the radio channel has been characterised each user is allocated carriers which have the best SNR ratio for that user. Since each user will be in a different location the fading pattern will be different for each remote station. The strongest carriers for one user are likely to be different from other users. Thus most users can be allocated the best carriers for them with minimal clashes. Preliminary studies have shown that adaptive hopping can provide a dramatic improvement in received power (5-20dB) in a frequency selective channel. Adaptive hopping virtually eliminates frequency selective fading. Figure 2. Received power verses distance travelled for Adaptive Frequency Hopping and for a fixed frequency. Figures 1 and 2 show results for a single user adaptive frequency hopping system. The radio channel model used for this experiment was measured for a link between two rooms in the Electrical and Computer Engineering building at JCU. The transmitter and receiver were spaced 24 m apart. Figure 1 shows simulated adaptive frequency hopping for this measured radio channel. 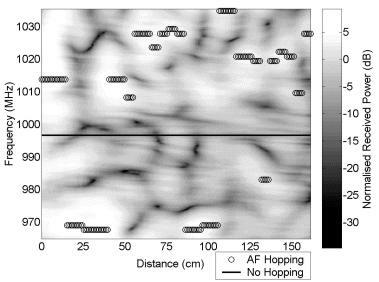 For the No Hopping case the frequency used was fixed and thus a straight line on figure 1. The bandwidth allocated to the user was 1% of the system bandwidth. The user was allocated the strongest frequency band and the frequency allocation was updated every 5 cm. Figure 2 shows for the same measured channel the received power for the adaptive frequency hopping receiver and for one which has no hopping. The adaptive hopping receiver suffers much less fast fading and has a much greater average power level than when no hopping was used. In a multipath channel the frequency response of the channel will change significantly in 15 cm at 1 GHz. It is therefore important that the frequency update rate is much faster than every 15 cm moved. Typically an update distance of 5 cm is sufficient. At a velocity of 60 km/Hr this results in an update rate of 330 times per sec. The overhead for the frequency hopping will depend on the user data rate, the number of users, and whether the system is a full, or half duplex system. For a full duplex system the transmitter and receiver frequency are offset from each other by >40 MHz to allow for isolation between them. For this type of transmission the number of radio channels that must be characterised is 2N, where N is the number of users. The number of reference symbols that must be transmitted is N+1, one from the base station in the forward link and one from each user. This can be reduced by transmitted a comb pattern, allowing typically 20 users to be characterised per reference symbol. However for a 10MHz system BW, full duplex system with 100 users at 50kbps each (QPSK average) and using a comb characterisation, the overhead will be 30-50% of the data capacity. This overhead can be reduced by using a time division half-duplex system. If both the forward and reverse links use the same frequency, then only one reference symbol is needed. A single reference symbol transmitted by the base station is received by all remote stations, allowing characterisation of all forward links. Due to the reciprocal nature of radio channels the transfer function of the reverse link will be the same as the forward link. Regardless of how the radio channels are characterised the number of frequency re-allocations will be proportional to the number of users. The overhead for a half-duplex system as described above will only be 10-15%. Adaptive frequency hopping reverts to normal random hopping when the velocity is too high for the hopping to keep up with the rate of change of the channel. Fortunately this occurs at high velocity and consequently the coherence time of the fading is very small. Time interleaving and forward error correction can be used to overcome these fading periods and since the fade time is short, the time interleaving length required is also short, resulting in minimal delay. Adaptive hopping comes at the cost of increasing the complexity of the transmitter and receiver. Additionally adaptive hopping is less useful at high velocities over 30 km/Hr. Carriers can be allocated in a comb pattern, spreading them over the entire system bandwidth. This improves the frequency diversity, preventing all the carriers used by a user being lost in a null in the spectrum. However, this allocation scheme may be susceptible to inter-user interference. This type of user allocation is useful in applications that can not use adaptive hopping. Figure 3 shows an example of a comb user carrier allocation. ODFM signals are intrinsically multipath robust due to the low symbol rate used and the addition of a time domain guard period . Multipath reflections that have a delay spread less than the guard period cause no inter-symbol interference. This allows for Single Frequency Networks (SFN) to be used in broadcast OFDM systems . A single frequency can be used for all transmitters in a country wide broadcast. For DAB the transmitter can be spaced up to 75 km apart. Normally each transmitter must use a different frequency from neighbouring transmitters, as they would appear as strong multipath if the same frequency were used. A SFN greatly reduces shadowing as multiple signals are received from different directions resulting in spacial diversity. The concept of a SFN can be applied to a multiuser OFDM system. The base station would consist of multiple repeaters transmitting the same signal. Each signals received by the repeaters can either be combined and decoded with a single central receiver, or each repeater could have its own receiver. Using a multiple transmitter cell will significantly reduce shadowing due to the increased spacial diversity, as shown in figure 4. Multiple transmitter cells are particularly suitable for wireless LAN applications. Shadowing makes it difficult to achieve good coverage of a building. Repeaters are often required, except that in conventional systems these repeaters cause multipath problems. In a multiuser OFDM system repeaters could be added where needed, with no additional problems. A multiple transmitter cell could be as simple as a coax running the length of a building corridor with multiple tap off points (see figure 5). 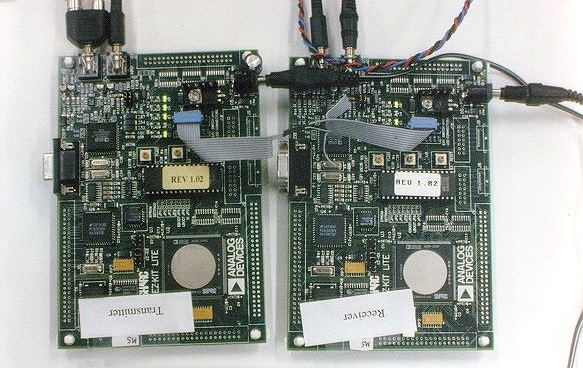 A small-scale test system was made using Analog Devices Ez-Kit evaluation boards. This board includes a 40 MHz SHARC® DSP processor, a 16 bit stereo CODEC, bootloader kernel, and a serial interface. A baseband multiuser OFDM system was implemented using the on- board CODECs. The maximum sample rate for the CODECs was 48 kHz. A 512 point real FFT was used for signal generation, of which 196 carriers were active, giving a bandwidth of 18 kHz. A guard period of 32 samples was used. Each transceiver was made using two Ez-kit boards. Figure 6 shows one of the multiuser OFDM transceivers. A three user system was made consisting of a base station and two remote stations. The forward link transmission was subdivided into 2 groups of 96 carriers, one group for each user. The reverse link transmission from each remote station was a group of 96 carriers. One remote station used the lower 96 carriers, the other the upper 96 carriers. No adaptive frequency hopping was used. The input data for each user was an audio signal sampled at 8 kHz at 8 bits. This data was modulated with 256 PSK, using a linear mapping from the 8 bit audio data. Due to the linear mapping errors in reception have only a small effect. The modulation was fixed to simplify the system. Multiuser OFDM requires strict time and frequency synchronisation. In the reverse link the signals from all users are combined in the channel and are received as a complete OFDM signal. All remote stations must be frequency and time synchronised in order for the transmitted signals to remain orthogonal to each other. All signals in the forward channel originate from the base station, and thus synchronisation techniques developed for broadcast OFDM can be used [3, 4]. The remote stations were synchronised to the base station using a null symbol frame synchronisation. The base station transmitted a null symbol at the start of each frame (36 symbols). The remote stations synchronised to the null using a moving average envelope detector. The mobile system was found to work, with no apparent cross talk between the two users. The forward link synchronisation was found to be stable, with an error of ~1-2 samples/frame at a high SNR, degrading to 8-32 samples at a SNR of 1dB. Reverse link synchronisation was slightly worse caused by difference in forward synchronisation of the two users. This paper has presented an overview of multiuser OFDM and some of the new techniques that can enhance system performance. Multiuser OFDM allows for highly flexible communications, thus can be made to adapt to radio channel conditions. This adaptability results in a high spectral efficiency and reliability.